Improving Patient Care At A Fraction Of The Cost! Are your nurses cutting the end out of plastic bags, spending 5 - 10 minutes and a lot of tape in an attempt to protect patient IV’s and bandages for their daily bathing? What happens when that necessary protection leaks? ArmRx® is the ultimate simple solution to this problem at a fraction of the cost of makeshift and potentially leaking protective covers. 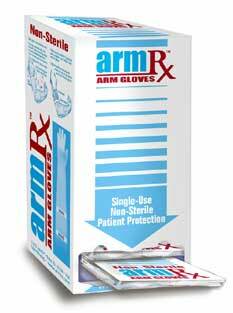 Self dispensing counter top or shelf box contains 30 Individual Hospital Arm Glove packages. Each Individual Hospital Arm Glove package contains one ArmRx® Arm Glove, 2 ArmRx® hook and loop straps and complete instructions for installation and use. Each single pack of ArmRx® Arm Gloves consist of a single arm sleeve with 2 "hook and loop" straps that adjust the glove to the required size and fasten it securely on the limb, forming a watertight pocket that helps keep the user's arm completely dry even during total submersion in water.